Matthew 6:13b in minuscule 13. At the close of Matthew 6:13, most modern versions of the New Testament place the phrase, “For yours is the kingdom and the power and the glory forever; Amen” in a footnote, whereas the KJV, NKJV, WEB, and MEV have it in the text. (The hyper-paraphrase The Message also has it in the text, albeit in a rather distorted form.) Let’s take a closer look at the evidence pertaining to this textual contest. 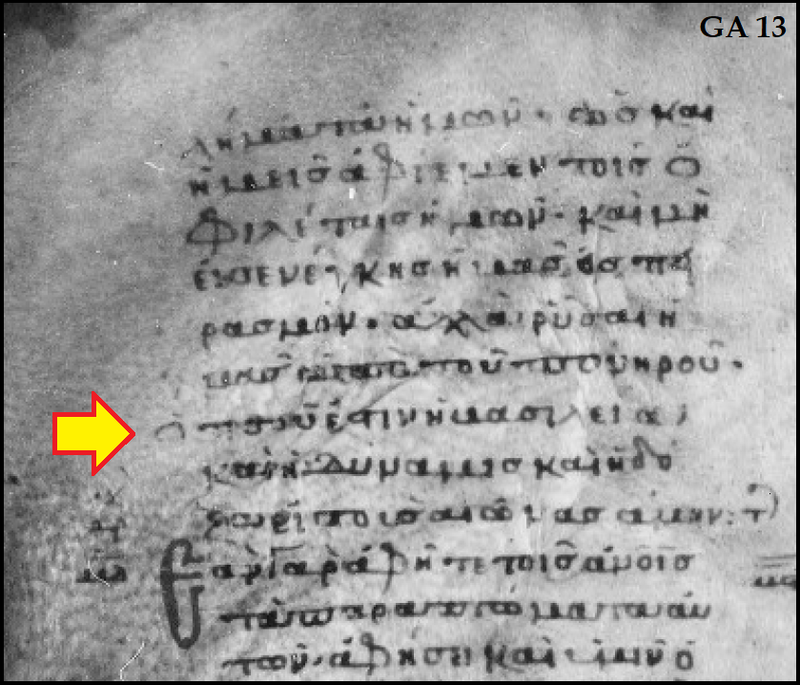 In about 98.5% of the Greek manuscripts that contain Matthew 6:13 (something around 1,500 MSS), the words ἀλλὰ ῥῦσαι ἡμᾶς ἀπὸ τοῦ πονηροῦ (“but deliver us from evil”) are followed by ὅτι σοῦ ἐστιν ἡ βασιλεία καὶ ἡ δύναμις καὶ ἡ δόξα εἰς τοὺς αἰῶνας ἀμήν (“For Yours is the kingdom and the power and the glory forever, Amen”). Some anomalous readings in this phrase appear in Greek manuscripts and versions, as the late Bruce Metzger pointed out in his Textual Commentary on the Greek New Testament: it “occurs in several forms,” which he listed, citing the Sahidic and Fayummic versions – which don’t mention “the kingdom” – and the habitually anomalous Old Latin Codex Bobbiensis – which only has the Latin equivalent of “For yours is the power forever and ever” – and minor liturgical expansions found in “some Greek manuscripts” and “Several late manuscripts.” However, Metzger frugally declined to share with readers the consistency with which the vast majority of Greek manuscripts perpetuate the words (with some allowance for spelling). Matthew 6:13 in Codex W.
Fortunately this gap in Metzger’s comments has been filled in by data presented by Jonathan Borland, who has pointed out that 1,416 manuscripts preserve the phrase exactly, and that all of the MSS from the 900s and earlier that have the phrase “contain the doxology completely intact, letter for letter.” Among these 105 MSS are Codices E G K L M S U V W Δ Θ Π Σ Φ Ω 047 0211 0233 0257 0287 and minuscules such as 33 123 151 274 405 461 565 773 892 1073 1077 1079 1080 1110 1172 1346 1424 1701 1816 2142 2414 and 2812. 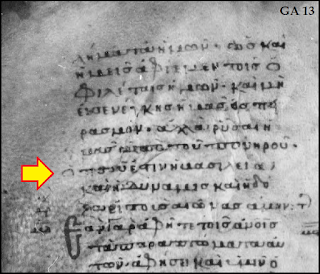 ● The final “Amen” is missing in 16 MSS, at least in the text written by the main scribe. Why is a passage with so much manuscript-support not included in the base-text of the NIV, ESV, CSB, etc.? Because it is absent from several important early witnesses. These include Vaticanus and Sinaiticus (the flagship manuscripts of the Alexandrian Text – as well as Codex Bezae (the flagship MS of the Western Text), Codex Z (035, from the 500s), 0170 (400s or 500s), and the leading members of family-1, and a smattering of other minuscules (130, 372, 890, 1090c, 2701s, 2737, 2780*, and 2786. In addition, most Old Latin copies do not include the doxology; nor do the Middle Egyptian version and the earliest strata of the Bohairic version. When considering the testimony of the Didache, however, two things need to be kept in mind: first, that the most complete manuscript of the Didache was produced in 1056, and its liturgical contents might have been influenced by factors that did not exist when it was initially composed. In other words, it is possible that the doxology-phrase might have been added to the Didache’s contents some time after the second century. Second, and dovetailing with that, the incorporation of parts of the Didache into other compositions such as Apostolic Constitutions Book VII (generally assigned to 380) and a sermon of St. Boniface suggests that its text was subject to customization, which is all the more reason why some researchers have suggested that it is somewhat precarious to treat the text of the Didache’s eleventh-century representative as if it must echo the second-century text. Fortunately we have a bit more data which may help us balance these factors. The main witness to the text of the Didache is Codex Hierosolymitanus 54 was discovered in 1873 by Philotheos Bryennios, the metropolitan of Nicomedia, at Constantinople. It contains not only the text of the Didache but some other early Christian compositions as well, such as the Epistle of Barnabas, First Clement, Second Clement, the long form of the Epistles of Ignatius, and the text known as the Epistle of Mary of Kassobelae to Ignatius. In 1922, Arthur Hunt published two small fragments which contained text from the first three chapters (1:3c-4a and 2:7b-3:2a) of the Didache – although the text of this fifth- or sixth-century witness, P. Oxy. 15.1782, varied from the contents of Codex Hierosolymitanus. The relevance of the textual variations in P.Oxy. 15.1782, however, are a matter of debate, inasmuch as this witness takes the form of a miniature codex – the fragments measure only 5 x 5.8 cm and 5.7 x 4.8 cm – and such small books may have been intended to include merely an abridged sample of the Didache’s contents. which thou preparedst for her. which you have prepared for it. Because thine is the power and the glory eternal, hamen. Let come the Lord, and let this world pass away, hamen. May grace come and may this world pass away. Osanna to the house of David. he who is not holy, let him repent. if any man is not, let him repent. Clearly both manuscripts are presenting the same prayer, and clearly the phrase “For yours is the power and the glory forever” is in them both. I note that while it is possible that a moment of inattentiveness could cause a scribe’s line of sight to skip from the ἡ before βασιλεία (“kingdom”) to the ἡ before δύναμις (“power”) and thus fail to preserve the reference to the kingdom, another and probably better explanation of the absence of the reference to the kingdom in this prayer (and in chapter 9) is that because this doxology-phrase is immediately preceded by a reference to God’s kingdom, the term was not used so as to avoid superfluity. Inasmuch as the Didache repeatedly borrows language from the Gospel of Matthew and uses Matthew’s form of the Lord’s model prayer (this is so indisputable that the point need not be argued), the concerns of those who are hesitant to affirm that Codex Hierosolymitanus 54 shows that the author of the Didache was familiar with a text of Matthew 6:13 that included the doxology may be alleviated by the combined testimony of Codex Hierosolymitanus 54 and Br. Mus. Or. 9271. Inasmuch as the Didache was probably composed when people who knew the apostle Matthew were still alive, this is an extremely weighty witness for the inclusion of the doxology in the original text of Matthew 6:13. I am Catholic and we always say the whole phrase, "For the kingdom and power and glory are your's forever." after the Lord's Prayer. That is a part of our liturgy. So we include it. Thanks for your excellent research. This shows how stable the text was, century after century. There simply is no such phenomena amongst the mss, spread out over as many centuries, that share any given distinctly Alexandrian reading. I would question the assertion that "all the manuscripts from the 10th century and earlier ... contain the doxology completely intact" when pre-10th century MSS lacking the doxology were already cited in the previous quoted portion. Also, one key reason for omitting the doxology may lie in the liturgical practice of the Greek Orthodox church, since after the recitation of most of the prayer by the laity, only the priest recites the closing doxology, and that in a low voice. Good research. Personally I find the omission (as James noted) by Origen in his thorough and enjoyable piece “On Prayer” difficult to overcome. And Origen was not shy about noting and exploring variants among copies found in both OT and NT. Similar wording can be found in Revelation 4:11 so either way it’s a valid praise to express to God. What was being claimed obviously was not that the doxology was present in every pre-10th century manuscript, but that variations to the doxology are ONLY present in later manuscripts. Those earlier ones that do have it, have it exactly--unlike the "oldest and best manuscripts" which rarely agree exactly other than in what they leave out--and anything multiplied by zero is always zero, so that's not exactly the kind of perfect agreement to brag about, especially if that's all you have. Biblica Versus the Facts About "Added Verses"